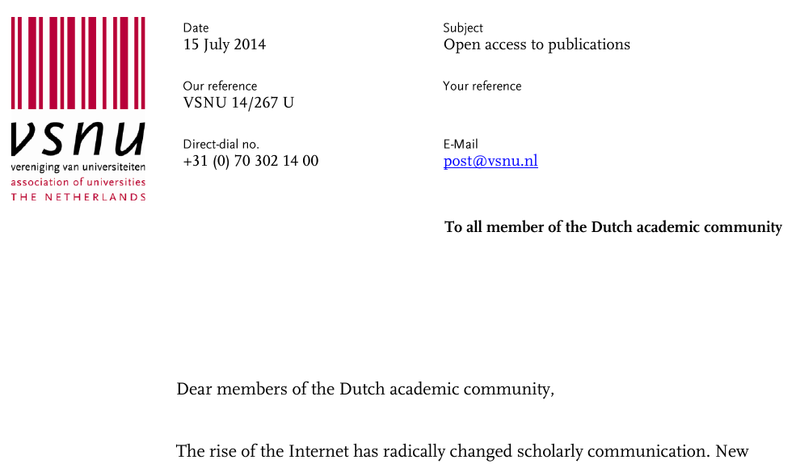 Yesterday, I received a letter from the Association of Universities The Netherlands (VSNU, @deVSNU) about Open Access. The Netherlands is for research a very interesting country: it's small, meaning we have few resources to establish and maintain high profile centers, we also believe strong education benefits from distribution, so we we have many good universities, rather than a few excelling universities. Mind you, this clouds that we absolutely do have excelling research institutes and research groups; they just are not concentrated in one university. Another important aspect is that all those Dutch universities are expected to compete which each other for funding. As a result I have experience rather interesting collaborations between universities. That's a downside of a small country: everyone knows each other, often in way to much detail. But my point is that the Dutch can be rather conservative. That kills innovation, and is in my opinion a key reason why we are not breaking into the top 50 of rankings, more than concentration. Concentration of funding in Top research institutes has not been extensively evaluated, but I think the efficiency is not proven higher than previous funding approaches. Anyway, this letter I received is part of their Open Access program. Here too, the Dutch universities are conservative (well, relatively from my views, at least). Now, the Open Access debate is not so interesting, because it primarily ends up about who pays who (boring) and whether we should go gold or green (besides the point, see below), and, sadly, here too many people think about who pays who again (still boring). Therefore, giving the outlined importance and impact of Dutch research, I found it relevant to post about the progress of Open Access in my small country. The letter is available in English. "[they] are also appealing to you to continue to advocate free access to your own scientific publications." Well, I have, not so actively, and maybe this post can be the start of a change. Because what basically bothers me is that the Open Access discussion, also in The Netherlands, is biased. And indeed, the letter continues with a section about gold and green access. If the VSNU really wants to promote free access to research, it should not even accept green. We all know that it is not about being able to look at (free), but to be able to mix and improve. Reuse. Continue. Stand on shoulders. The fact that this letter focuses on publications only, does not spend a word on reuse, is rather depressing and not giving me even the slightest hint that The Netherlands will break into that Top 50 any time soon. more sustainable route to Open Access." For the past ten years, publishers have been offering journals in package deals referred to as Big Deals. Shortly negotiations with the major publishers about these Big Deals Will take place, including Elsevier, Springer and Wiley. The Dutch universities have expressed their wish to make agreements with these publishers about the transition to Open Access as part of those Big Deals. Universities expect publishers to take serious steps to facilitate that transition. I hope the VSNU will clarify with what they mean with "serious". Because they all came up with "me too" solutions (setting up new OA journals) without seriously changing their model. No large publisher dared making the flagship journals full gold Open Access. That is serious business; all we see now is scribbling in the margin. Perhaps that is the reason of the wish to be in the top 50. Maybe the VSNU just wants a better bargaining position. you will ask publishers to convert to an Open Access model. Of course, I am more than willing to help the VNSU with this transition. I can be reached at the Department of Bioinformatics - BiGCaT, NUTRIM, FHML, Maastricht University. There are many options I have missed here (like data repositories, data citing, DOIs, and whatever). PS. my ImpactStory profile will tell you that more than 80% of my publications are Open Access. Not all gold yet, but I am working on changing that for some old papers.